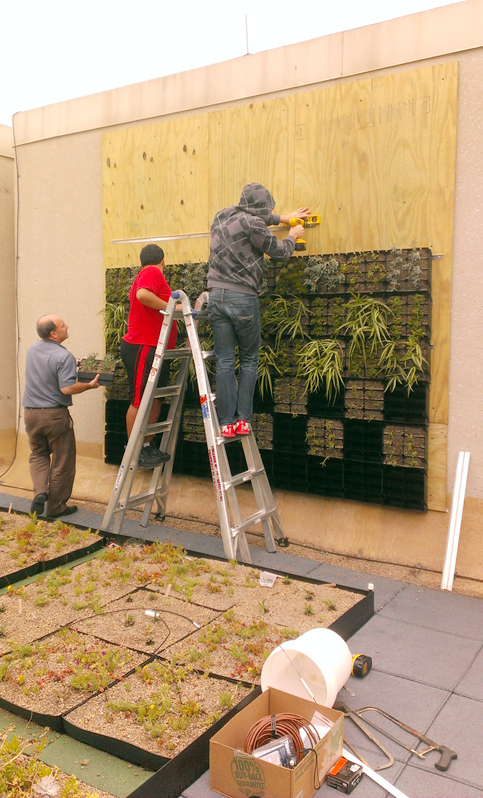 After planting all the modules, we proceeded to construct the living wall on the rooftop of the Langford architecture building. These modules did not include those designated for the Asian Jasmine plants since they were not yet fully established. 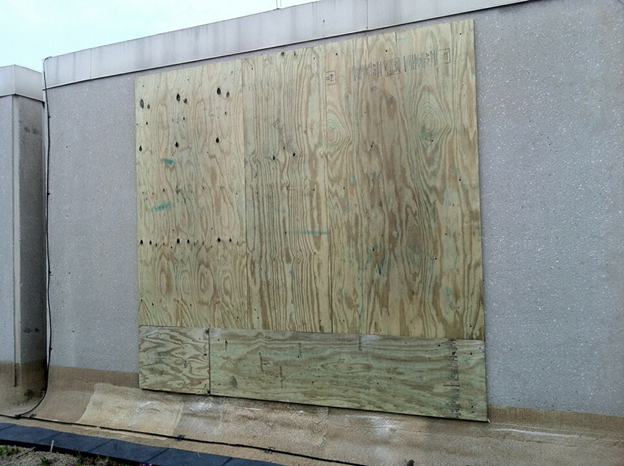 On the first day, we managed to mount the plywood boards onto the concrete wall, but not without some challenges along the way. We were very fortunate to have the aid of Jim, the wood shop supervisor, who provided most of the tools used for mounting the plywood. We spent the following weeks mounting the aluminum strips and plant modules onto the plywood structure we had made and ended up finishing the wall a day before the end of the semester. Due to time constraints; however, we were unable to install the irrigation system and frame as planned. This will likely be addressed over the summer, but in the meantime, the wall will be kept hydrated by having someone spray it with water as needed. In the end, we were lucky to have such a great team of students who were more than willing to assist with the various stages of this project. Without our teamwork and the guidance of our instructors, this project would not have been possible. Furthermore, the experiences I’ve gained through this project should prove most useful in my final studies regarding the relationship between urban green infrastructure and active/healthy living. These experiences will also help in developing strategies for promoting and implementing these type of systems within urban areas and future developments. 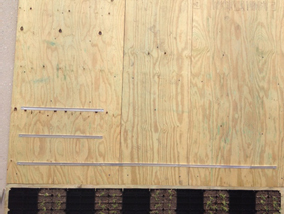 After months of planning, construction of the living wall has quickly got underway and is beginning to show progress. Today’s session was a continuation of the planting process, which consisted of combining drainage medium, soil, and plants into the plant modules that make up the living wall. Each module holds about ten plants and is designed in a slanted pattern to help keep the plants and soil from falling out. 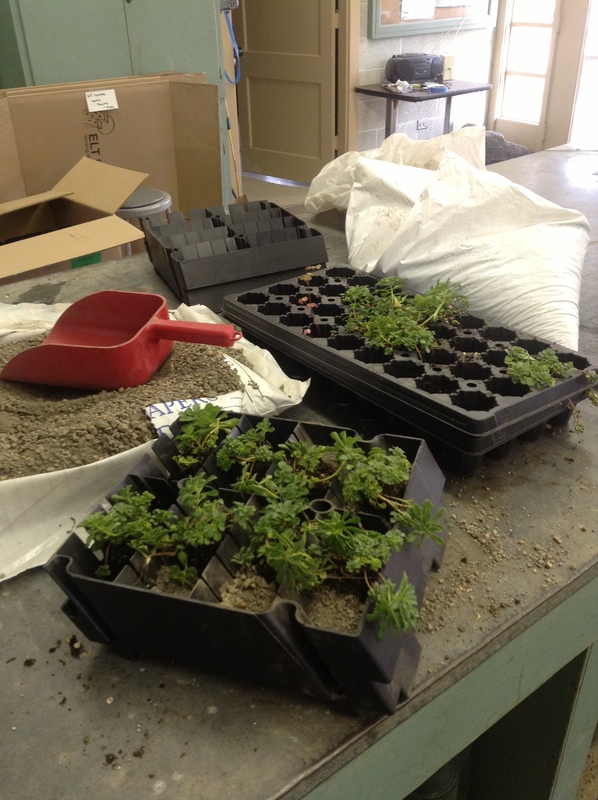 With 100 modules to plant and about 10 species to work with, we truly had our work cut out for us. If there is anything I learned from this process, it’s that designing and installing a living wall is much more complex than just planting plants vertically. Proper plant selection is crucial in producing a long-lasting system and providing opportunities for biodiversity. Today we finished the green wall. It looks great and felt awesome to see the final project complete! It took a couple of hours to finish and Kirk was the only one who could really install the last few modules because he had to stand on the ladder, which made it difficult with only one person working on it, but it was only the last three rows and didn’t take too long. From this project I learned a lot about green walls and how they can help the environment as well as be beneficial to buildings and homes both aesthetically and economically. I also learned about different species of plants and drought tolerant plants, and I believe we chose the correct varieties for our green wall. I look forward to being able to work on this project more during the summer and see how the wall performs long term. This class has been a great learning experience for me and I really enjoyed working with the green wall team and got to know some really interesting people. I am so proud of our final project because it took a lot of planning and discussion and it turned out really well. 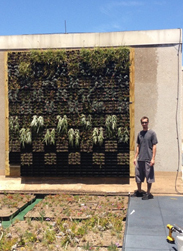 Living wall with Kirk Laminack. Photo by Rachel. Today was the first day of installing the modules. We met at the greenhouse to complete planting the modules that were being installed today and next week, and also transplanted some plants that will be planted on the green roof. We then went to Langford to begin the installation of the modules. It took us a little while to get a system going but once we got started it went by fairly quick. The hardest part was making sure each section was level. Below are some photos of the first module being put up and the first row of modules set up. The Living Wall Modules Going Up! Today continued where we left off last week. We installed the metal strips where the modules hang and put up about half of the modules. This presented a unique set of challenges. First we had to make sure that the strips were perfectly leveled and covered 10 feet in length, but this was complicated by the fact that they were not all exactly the same. Some of them were set at a slightly different angle and some were larger than others. 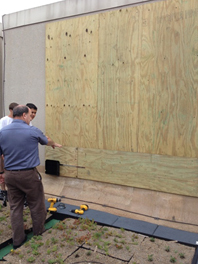 They measured about 3 feet, so we needed to cut some in three part so that we could install the 10 feet required. Rachel and JC were in charge of that. Meanwhile Kirk, and I worked on installing the metal strips. Later Kirk and I went to get the planted modules from the greenhouse while the rest of the team added more metal strips. We put up the modules according to a specific pattern designed by the students and Professor Dvorak. Since the Asian Jasmine was still rooting and not ready to be planted in the modules we used empty modules instead. We tried to propagate the Asian Jasmine a few weeks ago by dipping cuttings into rooting hormone, but they were taking a long time to root. This made me realize the many uncertainties when you are dealing with natural systems. It’s impossible to control every single variable, so sometimes you have to be patient and only nudge natural systems one way or the other and let them run their course. The good thing is that most other plants were ready and seem to be doing well in the modules. Here is a picture of the wall up to now. We hope to finish the semester next week by installing the last modules. We finally started putting up the wall! Recap until now: We ordered the green wall materials from ELT Easy Green after comparing it to other systems and deciding it was the best for our application/budget. The materials arrived a few weeks ago and we have been filling the modules, first with drainage media, then soil, then plants. It was a great experience because I learned about the soil physics and how its composition affects its water holding capacity. This in turn is very important for the plants because too much water can be just as bad as not enough water. So finding the right mix of soil and hardy plants for the local environment are the key to a successful green roof or wall. Now that most of them are planted we are going to install them, however it’s not as easy as it seems. 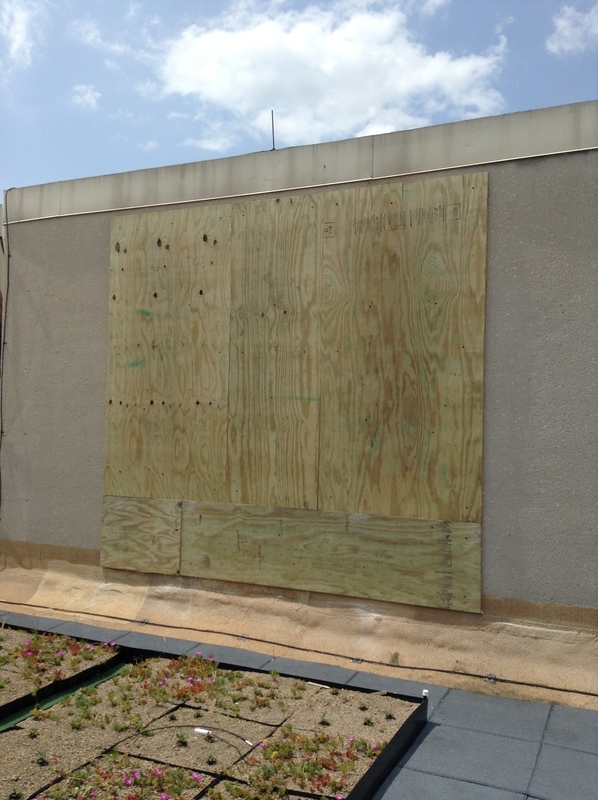 First, we installed install a plywood cover on the wall so that we can attach the modules to it, thus saving us time and effort by drilling into wood instead of concrete. Here is a picture of how it looks. We had to carry it piece by piece up to the roof because the elevator was too small. Needless to say it was really heavy. Once it was up there we drilled holes at the corners and some in the center of each piece, we leveled it against the wall and drilled in the same holes through the concrete. Then we used self-tapping screws to attach it. We soon realized that the Philips head on the screws was not sturdy enough and that they were stripping before going all the way in. We fixed it by replacing the Philips head screws with hex heads. Even though it was a pretty hot day we got to move forward on the project and we had a lot of fun working. 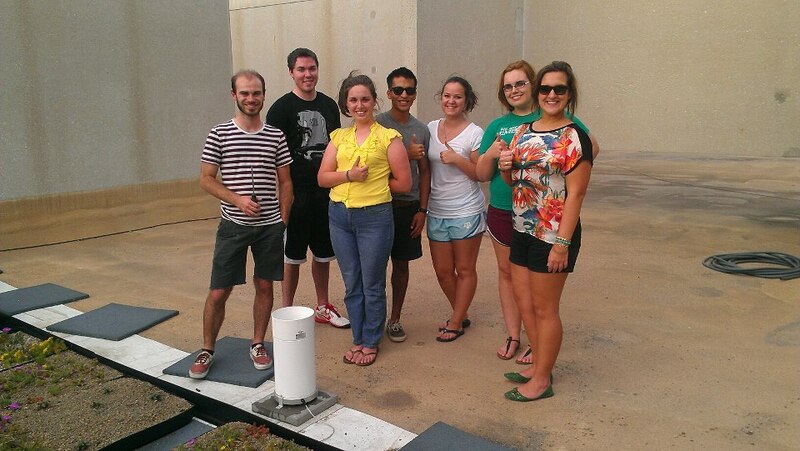 As mentioned last week, the ATMO team was able to install many meteorological instruments on the roof this semester. As the school year comes to a close, and a few of our green-roofers prepare to graduate, we look forward to the projects future teams will work on. 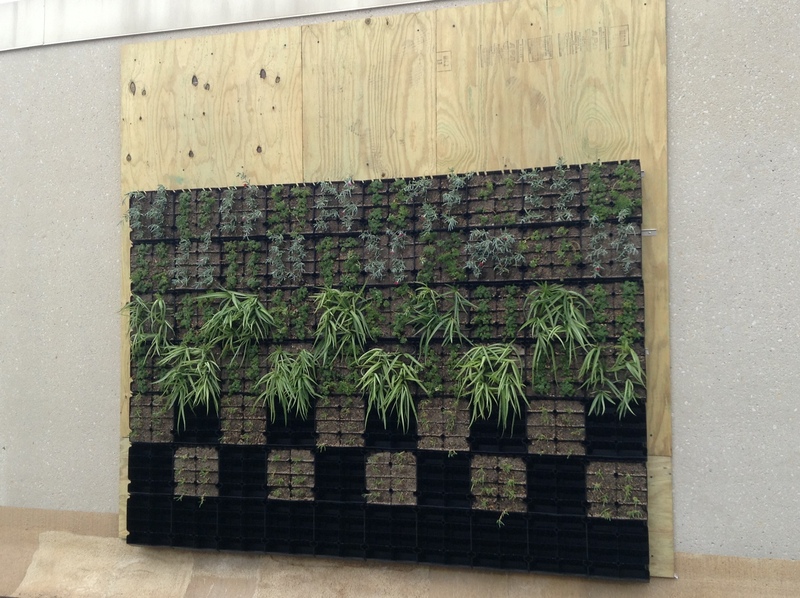 Last weekend, all green roof participants joined together to begin installing a living wall. This project is almost complete! 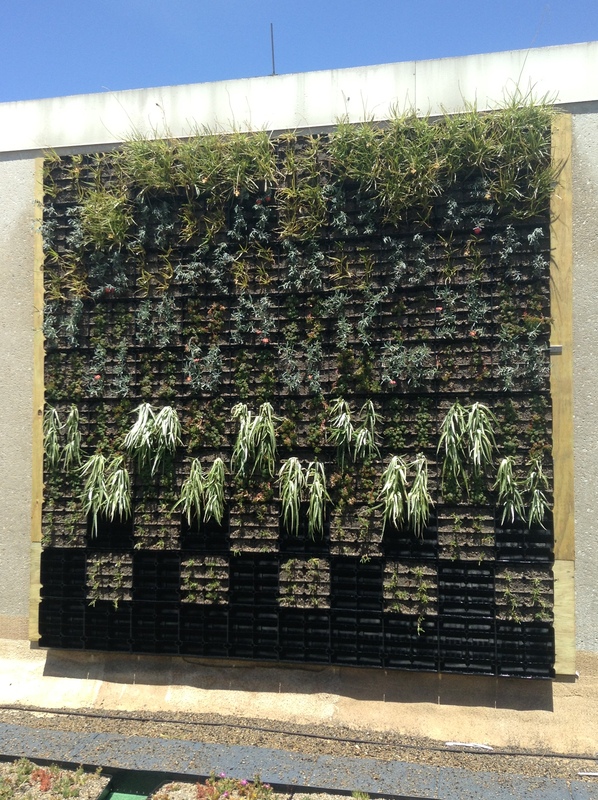 With a living wall in place, we can begin to understand how it affects the microclimate on the roof. It also adds a nice aesthetic element. One side of our green roof is completely decked out in instruments, but we will be installing more probes, and possibly another weather station, on the other side in upcoming semesters. As the green roof comes together, future teams will be able to analyze the data collected by the instruments we installed and begin drawing conclusions about the impact this roof is having. We also look forward to the day when the roof will be opened up to the public, and all Texas A&M students can enjoy the green roof we have built!